I’ll be honest. The very first time that I saw the third film in the Spider-Man franchise, I loved it. I may have even seen the midnight premiere. I was too blind, though, to really see what everyone was saying. Now I understand a lot better, not that I agree completely with what other critics have said. The biggest flaw of the film is being way too complicated for its own good. They knew they probably only had the one film, and they wanted to end it explosively, in a way that pleased both them and the fans…the problem is that we’re only human…we can only focus on so many plots before we start throwing tomatoes at the screen. 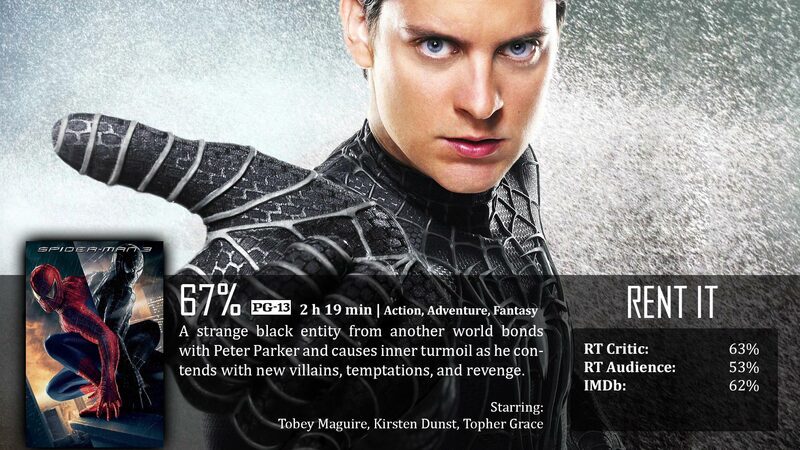 So here it is…Spider-Man 3. The life Spider-Man has been living is good, and people love him. His ego has taken control, and he has been unable to see Mary-Jane’s career struggles. When an alien symbiote attaches itself to Spider-Man’s costume, it turns black, enhancing Spider-Man’s abilities. At the same time though, it turns Peter’s heart and soul black as well. Meanwhile, Flint Marco stumbles upon a particle enhancer, blending the particles in his body with that of the sand he walked on, transforming him into Sandman. Also meanwhile, Harry Osborn has finally locked in a plan to kill Peter once and for all, with his father’s formula he became a newer, faster, and stronger version of the Green Goblin. Also also meanwhile, Eddie Brock makes his appearance in the franchise, known better as his later counterpart: Venom. Alright, so for the most part, you have to keep up with five people at all times. Each of these storylines could almost be a movie all in themselves, and for them all to be put together for one film surprisingly didn’t make this film feel short and incomplete as much as it made the film feel long. It felt like you are sitting there watching the movie relentlessly for days. It feels like different movies put on shuffle for an audience while you just sit there and try to piece it together like it’s a jigsaw puzzle. It’s not like the whole thing is horrid. It’s not. We have some good ideas, they just weren’t fully done right. Like the theme…it’s clearly about pride and second chances. Pride cometh before the fall comes to mind pretty clearly while watching this, but not as much as second chances. As I’ve laid out the characters above, you can see a lot of them get the opportunity to accept a second chance, which leads to another, quieter theme of – it’s never too late. Commendable, but even though we have a good theme, we are just disappointed all around. The problem with the venom storyline is that it was done just to please those raved fans. Venom, of course, is one of the most popular, if not the most popular villain for Spider-Man, and fans everywhere wanted to see how Tobey’s version of Spider-Man could face off against this creature. Unfortunately, we are almost disappointed at every angle. Spider-Man’s black suit was just a black and white version of the suit we’ve already seen before. The black suit is iconic in the comics, but there wasn’t anything really…special here. Then we have Venom. First of all, he’s on screen for like, the last 10-15 minutes added onto two hours that we’ve already seen. Second of all, they could have used their strength in the CGI department to focus on making Venom a terrifying creature to use throughout the film instead of making him what they did…which was something rather weak in the long run. Weak and anticlimactic, actually. It was a cop-out to have Venom’s face revert to Brock’s every time he spoke…wow. I will say the transition from Black Spider-Man to Venom was perfect, though. Straight out of the comics and even cartoon show. Practically shot for shot. Now…when Flint Marco turned into Sandman…that was spectacular. That scene remains in my heart, one of the coolest and most beautiful CGI sequences I have ever seen in a film…period. Also, Thomas Haden Church had some really strong performances here. In fact, out of all of the acting seen in this film, I would say that without a doubt, Church’s performance was the strongest and most human performance of all. I wouldn’t get rid of his performance or character, I would get rid of Venom’s. Way to screw up your villains, Marvel. Spider-Man 3 no doubt had quite a bit of promise, but they overshot their vision and made the film the most obnoxious and confusing plot out of any Spider-Man movie, which is truly unfortunate. I also quite liked Thomas Hayden Church’s performance, but it felt like it was placed in the wrong movie. He’s supposed to be sympathetic, and yet he’s also the object of Parker’s revenge through the horrible idea of calling back to the first movie and dredging up Ben Parker’s murder. And through all this seriousness going on, there’s the cheesy/goofy emo Peter scenes that are completely the wrong tone, I can see with adding some comic relief, but that just went the wrong direction. Topher Grace was also a really odd choice for Eddie Brock coming off of That 70’s Show. I think I also liked it during my first theater viewing, but it absolutely doesn’t hold up to repeat viewings.